Remember the ranch dressing mix I posted a few weeks ago? This stuff? 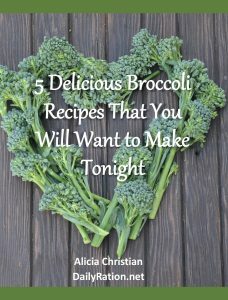 Like most people, I use it for more than making ranch dressing. 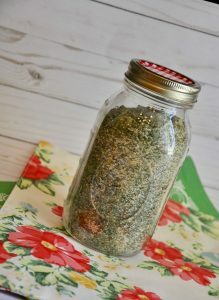 I use it for a ton of recipes that call for a packet of dry ranch dressing mix. I use it for dips. 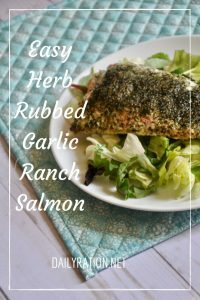 And I use it for this delicious ranch salmon. This succulent and savory 30-minute meal. This is one of those meals that takes less than half an hour and very little effort. I typically make it on a busy night. If it weren’t for the cost of salmon, it’d be a weekly throwdown meal. With the ranch seasoning ready to go, the time taken to measure and combine herbs is already done for you. Just shake and bake…so to speak. Are you ready for this long cooking lesson? Step 1- Pour melted butter over your salmon. Step 2- Generously sprinkle dry ranch mix over the butter and rub it all in evenly. Step 3- Roast in the oven or grill. That’s it. You’re done. I’ve included a printable recipe card, but really you don’t need to measure. Just have enough butter and enough ranch mix- which is really a personal taste thing. I have it here on a salad, but I’ve also flaked it and mixed it into pasta. What would you do with it? Let me know in the comments! 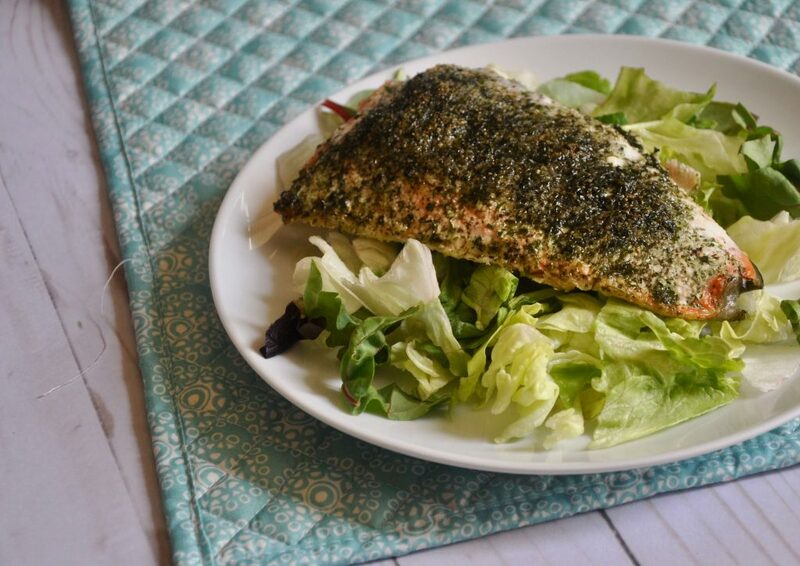 In less than 30 minutes you can have this flavorful, healthy ranch salmon on the table. Buttery, herby and so full of flavor. Preheat your oven to 400 degrees or preheat the grill to medium. Rinse your salmon and pat it dry. Lay fish on a parchment covered cookie sheet. Drizzle melted butter evenly over the salmon. Shake 1 Tablespoon of dry ranch mix over each fillet. Rub the butter and dry herby dry mix evenly over each piece of fish. Roast in oven at 400 degrees for 12-15 minutes or until it flakes with a fork. No need to turn. Alternatively, grill over medium, covered for 10-12 minutes.